Though we are not great swimmers, somehow, Andaman has been fascinating and avoiding us for quite a long time. There was an aborted attempt to visit this place in April 2014 due to some last minute exigency. Anyways, finally we made it during January 2015 ( a better time than April which we earlier missed) for which planning has started 4 months back in September, 2014 by way of booking economically priced return tickets from Hyderabad to Port Blair. For two of us it was just 13,000 rupees which we might pay for one way journey to Delhi sometimes. Generally, the prices are at their low during January - March for obvious reasons and it is a good time to choose beaches during this period, if we can afford time. 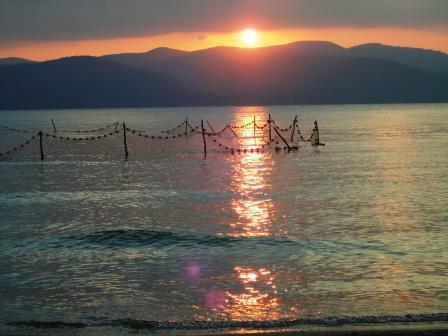 Andaman has some beautiful landscape, deep sea, virgin beaches and abundant natural wealth. Andaman has about 550 Islands spread over 750 km and important islands in the group are the North, Middle and South Andaman – popularly known as 'Great Andaman'. Here People speak Hindi and English. Of course quite a few speak, Tamil, Telugu as well. They are friendly and tourism is a major source of income. The transport is like in India and we can move on our own without a dedicated vehicle at our disposal. Autos and taxis are available here like in any other city in India. One of the reasons we chose a customized package was, we were under the impression that dedicated vehicle is a must in these tourist places. But this is not so in Andaman including at Havelock island or Nile land which we visited as part of our 5-night six-day package which cost us about 40000 rupees for both that included everything excluding meals and shopping (!!). 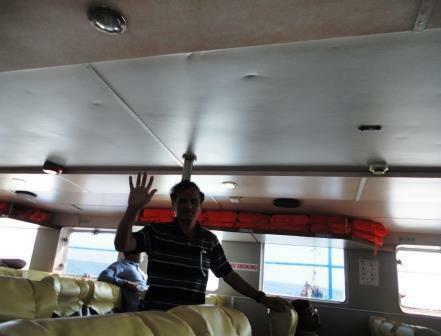 It was January 18th morning we set out on our tour to Port Blair via Chennai. The journey lasted about 3.5 hours with a transit time of around 2 hours at Chennai, and brought us to Port Blair around 12.30 pm. Debunking our fear and to our relief Spice jet maintained its schedule on that day. Our tour manager received us with courtesy. The itinerary and planning was very meticulous and there was no time we worried or waited for the vehicle or for that matter anything committed by the tour operator. They won't provide you with a dedicated vehicle but suitably manage their network of vehicles to pick up and drop you as per the itinerary. This is one distinctive feature and this arrangement is taken care even when you visit other islands such as Havelock, Neil etc. It is good in a way you reduce the number of vehicles on the road and make use of the vehicles effectively. We liked this. Our first visit was to Anthropological and Fisheries Museum. It was quite educational and the place has been kept tidily. 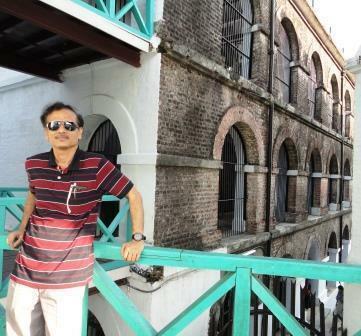 We then proceeded to Cellular Museum and Cellular Jail, which now is a memorial for freedom fighters during the freedom struggle. It is a National Monument. We were taken to the bygone era for a while when we saw the light and sound show in the evening, which lasted for an hour. Our visit to Ross Island the next day was exciting for its surroundings, lotus ponds, antelopes and panoramic scenery. It is one of the major tourist destinations here. We can see some wartime bunkers here and take a quick stroll in the island. They give you about 2 hours to return. All the ferry tickets are available freely across the city or on line. For us the tour operator has arranged. The city is also environment friendly and does not encourage plastic. On the 3rd day i.e. 20th January 2015 we set out to explore Havelock Island. 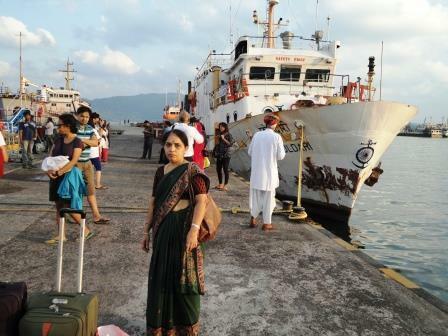 This was by a luxury cruise and takes about 2.5 hours from Port Blair. Two classes of tickets are available and prefer the upper deck with better seats and view and it is marginally costly. The island is known as 'one of the jewels of the Andaman'. 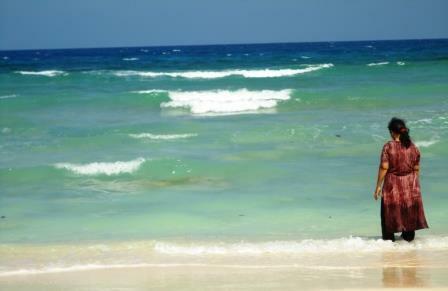 This beach is quite famous and much touted in the travel pages of Andaman. We visited Elephant Beach, one of the unique beaches located in Havelock Island. Corals in this beach are simply the best on the island. We enjoyed snorkelling at Elephant Beach. We went for sea walk which is quite exhilarating and you need not know swimming for this purpose. It would cost Rs2500 per person that includes a short boat ride to the place in the sea, oxigen mask, guide with you and you just sink into the sea with a helmet looking oxigen mask for about 15 feet and start walking in a well fenced area with nets. You can see lots of fish moving around you without the fear of any bigger sea animal coming close to you. You take a few snaps under water and they provide you a CD or on a pendrive if you can give them to transfer those photos. My wife ventured into this while I was gazing the distant skies from the decks of the steam boat. 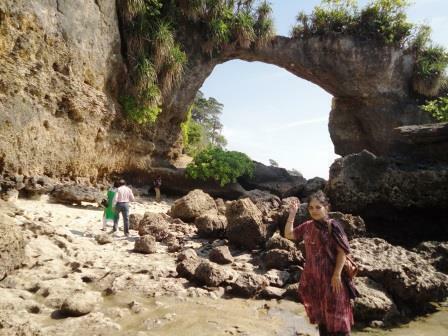 Later, we visited Neil Island, which is covered with lush green forest and sand. Neil island beach, more private than at Havelock. However, the entry was prohibited to the tribal reserve area in Nicobar Group of Islands, which is 350kms away from mother land Andaman. To all those who want to visit Andaman, it costs only Rs. 4,000 to go by ship and is connected from Chennai, Visakhapatnam and Kolkata and it takes four days to reach Port Blair by ship. If you are a big group without sea sickness and are able to manage it is fine otherwise journey by ship is not easy and we get sea sickness quickly. Alternately we should choose timing when the air fares are at their lowest and make budget accommodation at the destination which are available and make the tour cost affordable. Another way of reducing the fares is go upto chennai or Kokata by train and take a flight from there. I have left out the details about Andaman history and other geographical aspects which you can get on the net any time. 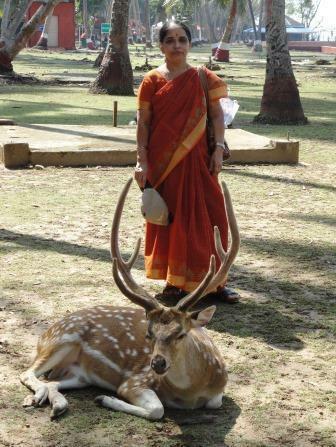 However I have inserted a few photographs to make the travelogue complete. Hope you enjoy it. Try visiting Andaman once. It's refreshing.